Mythology | THE MIDKNIGHT GARDEN: OUTSIDE OF TIME...THE KEEPERS OF SECRETS. A QUEEN, A KNIGHT & A LORD. So another fine day found us at the above locations seeking truths on the enduring legends that have surrounded these sites for many years. Tales of a mysterious headless horseman; a knight in fact of the realm, of whom his identity has always been shrouded in mystery. And the little know resting place of a fine Celtic warrior Queen, who was also a healer and teacher of alchemy and the further slotting together of lost royal bloodlines. The first port of call was to the interestingly named St Andrew Church (no ‘s’ at the end of Andrew) set amidst tranquil and idealic countryside in the village of Quidenham, Norfolk. St Andrew Church at Quidenham has stood on the banks of the River Whittle for over 1000 years and there is evidence of the site being a place of worship before the present building was erected. The present church dates from the 14th and 15th centuries; the round tower is Saxon dating from between 950 and 1050 AD and over the years, as in many churches respectful renewal and restoration has taken place. On the outside buttresses are three very interesting carvings said to be the sacred mongram ICH, the three nails of the crucifixion and the crown of thorns with the letters MR (Maria Regina) Part of the churchyard is a conservation area with many old tombs and monuments, many to the Albermarle family. Follow the link to our Youtube channel and let Alek introduce you to Queen Boudica, the Headless Horseman and Lord Arbemarle. Just a short way along the road and on the left hand side, is the actual resting place and memorial statue to Queen Boudica, which sadly is well out of public reach these days, probably purposefully so. It is all very overgrown and well hidden and unaccesable, in its small wooded area; the public is not encouraged to pass that way; even to pay respects. It is all told, a beautiful and peaceful area and church, with Saxon and Viking mounds nearby and just to see where Boudica’s castle or fortress is situated at Quidenham is an amazing experience. However one can make out the statue on google maps which in a small way does make up for having no access. Allow the Headless Horseman to introduce himself! Detailed shot of the family crest and historic tomb record of the Knight Sir Thomas Holland; aka The Headless Horseman! So many connections to be found here, to the other sites we have so far visited which will be revealed in time and why all the ‘happenings’ are at these sites; a pattern is emerging so as they say – stay tuned! 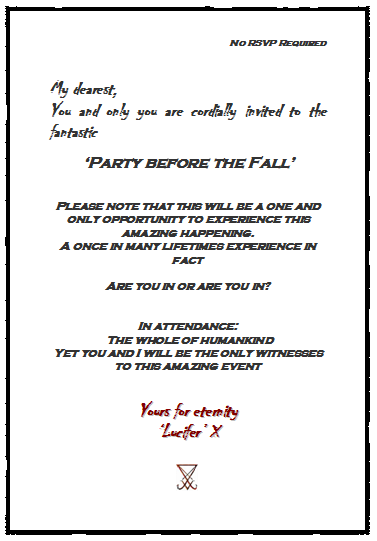 What would you do if you received an invite like this…………..? You can of course now read the whole story over on my ‘Midknights Tellings’ site…. UNRAVELLING CHRISTMAS: TRUTHS, MYTHS & TRADITIONS. A time of recognition of the cycle of the Green Man, a time for sharing life with others. Yule Greenery: Way before modern times people would decorate their homes at Yule with beautiful greenery such as Holly, Ivy and boughs of Fir; bought in fresh from their gardens and today many people, especially followers of Pagan and Craft traditions, still acknowledge this yuletide custom. Bringing the greenery indoors can completely change and uplift the energies inside one’s home, taking one back to a timeless place beyond the bright tinsel, gaudy baubles and glitz of today’s modern celebrations of yule; allowing people to find a much deeper and subtle connection to the season. The greenery we bring indoors at Yule has many connections to traditions and cultures all over the globe; both ancient and modern and throughout all time there have been many myths and legends associated with our Yule customs. The bright red berries and sharp thorns of the Holly are thought of as a tree traditionally sacred to the ‘God of Winter’ and yet interestingly within the Gnostic teachings Holly is aligned with the Goddess and in particular has close sacred associations with Mary Magdalene. Often wands were, and still are made of Holly and used in the recurring ritual battle between the Holly and Oak, the winter and summer tree kings. The Oak King, representing the light half of the year, rules from midwinter to midsummer and the Holly King, representing the dark half of the year, rules from midsummer to midwinter. Many pagans in their solstice/yule rites will re-enact this enduring tale and will take part in the retelling of the battle between these two mighty kings; the Oak King and the Holly King. Before the Yule tree was born those of Craft would hang a large ball of evergreen and Holly within their homes at Yule. From the ball would be draped red, white and black ribbons and paper roses, apples and oranges. The Ivy is known as a goddess tree, being also green in midwinter and so again is used for decorations; it was also used as a magical wand when twined around a suitable host. The Holly and Ivy do have further symbolism associated with them, for they represent man and woman, going on forever; the Lord and the Lady and it is said that the true sexual implications of Holly and Ivy carols can be discovered in the many recreated pagan versions of the present day carols. The Fir is also a goddess tree and is linked with twelfth night or Epiphany, when the three wise men (Magi) came, bearing gifts for Mary, Joseph and the tiny babe. In the pagan year however, this was when the young god now aged twelve was armed with his weapons and was sent forth by the goddess. The fir/pine cones carried by the priestess in many religious rites and also in many ancient carvings and paintings were said to be a masculine symbol and were said to endow the young god with virility and power. Yet also the pin cone is a metaphysical representation of the pineal gland; the third eye. Fir trees themselves were believed to be spirits of fertility, being evergreen and undying. Roman and Persian Connections: The Romans also celebrated their own festival of Saturnalia from December 17th to December 24th. It was a time of merry-making, feasting and the giving of gifts and they too would decorate their houses with greenery and lights. The Romans also practiced the Mithraic Mysteries and some sources say they celebrated the birthday of Mithras on the 25th December, although not everyone agrees with this. 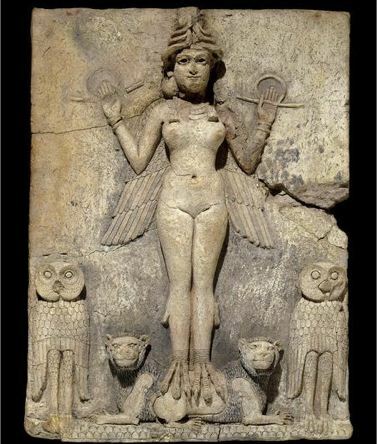 It is interesting to note that Azazel‘s cherub was known by the Persians as Mithras, the god of light and there are origins that confirm Mithraism was indeed of Persian origin. Firmicus Maternus tells us Mithraism was based on the Persian rituals of the Magi (See the Error of the Pagan Religions). The Magi, such as the three Magi (wise men) who sought Jesus at his birth, were Zoroastrians. The cult of Mithras was embraced by Roman Legionaries; it being a contemporary religion to the early Roman Catholic Church by whom was adopted the Mithraic Sacrament. The worship of Mithras (Azazel) in subterranean chambers was done to symbolise his entrapment within the earth. Mithras (aka Azazel‘s cherub Behemoth, the disk) was at times referred to under the religious title of Sol Invictus. Return of the Light: The reason for lights and candles at Yule; the winter solstice is very apt, for we are welcoming in the return of the light; the return of the sun, heralding in the lighter days to come. The return of the sun, the birth of the Light, (the birth of the son), in themselves have given birth to many ancient myths and customs around the world. Again, as for the other sacred times and Sabbats of the year, the celebration is built around recognition of major and significant planetary alignments and magnetics which causes a shift in our energies and consciousness here on earth. 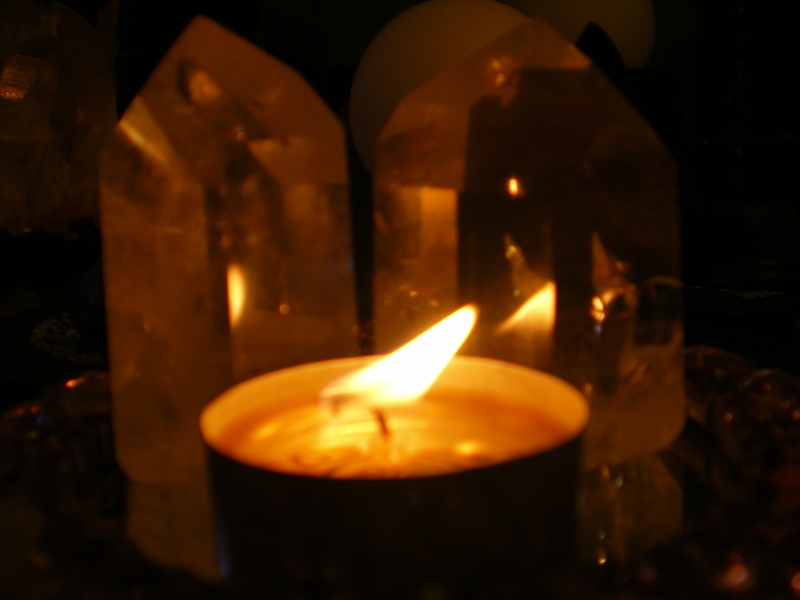 Connecting to the Light: At this time of year, at Yule; the winter solstice, the dark can seem even darker, the nights can seem even longer and the days can seem oh so cold, especially if we have had issues in our lives that are hard to come to terms with. It can be a time of being alone for so many people and because of loneliness, many folks simply hibernate during the dark months, awaiting the return of the light. So this welcome return of the Light can connect us to the Sun, Moon and Star of our past, present and future and in our Solstice prayers we can pray for inner guidance and request for the fire within our souls to be re-ignited as we ask that the Light will guide us through any challenging days that lie ahead. In connecting to the guiding Light, we are of course connecting to the Goddess whom the Knight Templars acknowledge as personified on earth as the Lady Mary Magdalene; known in ancient scriptures by her name of Kiam. For She may shine upon all who wish it and guide us to that inner place of peace and sanctuary, that special nous within our souls. 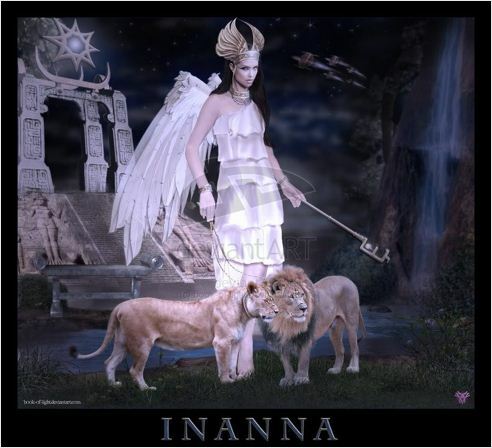 She will bless all those who ask guidance of her, will bestow her blessings upon all, of whatever path or spirituality we are, for we are all blessed and divine in the eyes of the Goddess. Gnostic and Templar Connections: Within the Knights Templar teachings, Yule is a celebration of Ilu or Nabu; a God festival. It is a time of recognition of the cycle of the Green Man, a time for sharing life with others. The future is developing within the womb of the earth, and the energy begins to shape and map the cycles of the future. It is a time to change habits and reduce negative thoughts around us. We give praise to the Light upon the Earth, in the knowledge that the lines of life will continue. The Crescent Moon of Ansar is featured in the Templar 21st degree, so could this crescent moon and its star have a direct connection to the holy star of Christian mythology; the ‘star’ that guided the three (the sacred 3) wise men or Magi towards the son of god? (son of the G.O.D. – son of the Universe?) Within the Templar path are further hidden meanings to this story and to the meaning of the moon and star and thinking along those lines one can now discover the sun, moon and star hidden in the well know story of the birth of Jesus. Searching for Lucifer: Many people who have trod a pagan path over the years will have realised that there was and is so much more to the Jesus and Mary, and Mary and Joseph tellings than ever met the eye, or had previously been taught. You may like myself have held on long and hard for a truth, realising that it was there somewhere yet was not being taught; you knew that something was hidden, something was missing. Even though it is quite common knowledge these days to acknowledge that Jesus/Malak was not actually born in December and this particular date was ‘borrowed’ by those who deemed it necessary, to keep the people of planet earth forever in darkness. But never the less what a very clever way though, for the ‘weavers of dark webs’ of old to simply hide the real truths they knew, displaying them for the peoples of the Earth as riddles for all to see (should of course they choose too) hidded within the pagan mythologies. So they hid the real truths of the universe from the people and wove a new false story onto the old customs and tellings. Meanwhile the poor unquestioning ‘Christian’ folks went along with these false tellings and as we all know, the story endured for centuries but one only needs to take a tiny peak behind the veil of illusion to see the real telling of the birth of Jesus/Malak. So thus the ‘Christian’s’ have kind of been preserving Templar/Universal truths in a very well-know tale for hundreds of years without realising it. It’s all there hiding in all the riddles and codes, hidden in plain sight, reiterating once again that the seen really can become the unseen and in these current days more and more people are awakening to the truths and messages that the returning Light will thus bring forth…. The Truth of Christmas: So we acknowledge that the birth of Malak to be the manifestation of the Universe made flesh; ‘The Word made Flesh’ and we know the name of Messiah or Christ to mean the “anointed” and of course most people are now very familiar, in varying degrees with the story of Mary and Joseph journeying to Bethlehem; Mary almost full term pregnant with child. They were there to register in an empire-wide census decreed by Rome and of course when they arrived, they found that Bethlehem was jam packed full of visitors from all over the region, so henceforth no place to stay. Joseph however was very resourceful and found temporary shelter in the stable of the inn they were supposed to be staying at and it is said that the young mother supposedly gave birth to Jesus/Malak on December 25th. The shepherds out in their fields and pastures now witnessed a stunning supernatural event; a great star in the heavens, a sign that the Christ Child was born. Also (and again supposedly) three ‘Wise Men’ from the east came to Bethlehem to honour Jesus. Herod, Rome’s client king over Judea, felt threatened by Jesus’ existence and since he could not find the child, Herod decided to massacre all baby boys that were estimated to be Jesus’ age. And so the account grew over the centuries, weaving chapters from the Bible with Christmas myths originating from the Babylonian mystery religions practiced by idol worshippers since the tower of Babel! To understand the events surrounding Jesus Christ’s birth and his early years; fact must be separated from fiction; for despite what billions believe today Jesus was not born on Dec 25th, or even in winter. He was in all likelihood born in early autumn. To make this fact clearer , it states in the Adam Clark Commentary, volume 5, page 370 (New York Edition) that “It was customary among Jews to send out their sheep to the deserts about the Passover (early spring), and bring them home at the commencement of the first rain” The first rains began in early to mid-fall. Luke 2:8 explains that when Christ was born “there were in the same country shepherds abiding in the field, keeping watch over their flock by night” Note that they were ‘abiding’ in the field. This could not have happened in December, or even close. Both Ezra 10:9-13 and the Song of Solomon 2:11 show that winter was the rainy season and the shepherds could not reside in cold, open fields at night. Numerous encyclopaedias plainly state that Jesus/Malak was not born on December 25. Even the Catholic Encyclopaedia confirms this! Then from where did the festival accounts associated with this date come from? The following quote can be found in the Encyclopaedia Britannica, under ‘Christmas’; “In the Roman world, the Saturnalia (December 17th) was a time of merry making and exchanging of gifts. December 25th was also regarded as the birthdate of the Iranian mystery god, Mithra, the Sun of Righteousness. On the Roman New Year (January 1st), houses were decorated with greenery and lights as mentioned previously, and gifts were given to children and the poor. Why late December? Understand that December 25th was not selected because it was the birth of Jesus Christ or because it was near that date. It was selected entirely because the 25th of December coincided with the idolatrous pagan festival of Saturnalia! In any event we do not know the exact date of Jesus’ birth (though in all likelihood he was born in the fall). While God certainly could have made it clearly known, He chose to hide it from the world’s eyes. For years the birth of Jesus has been shrouded in the pagan trappings of Christmas, whose traditions and practices predate Christ’s earthly ministry by thousands of years! Billions around the world exchange gifts with each other every December 25th, believing they are following the ‘three wise men’s’ custom of giving birthday gifts to Jesus. Yet the ‘three wise men’ of the Xmas myth are called ‘magi’ in the bible, magicians from the East. Scripture does not specify how many visited Jesus. Also, the magi gave gifts to the Christ Child out of respect and royal tradition. They acknowledged Him to be a king, and thus treated Him as such; practicing the custom of giving gifts to a royal ruler. These were in no sense birthday gifts, for by the time the magi visited Jesus, He and His parents were no longer in the stable; they were in a house, and the bible refers to Christ as a ‘young child’ (Matt.2:8, 11), not a baby. Much time had passed since Jesus had been born! When we separate fact from fiction – that is, biblical truth from sadly, the lies and deceits of the pagan myths and legend – we get a better, much clearer view of the true Jesus Christ and of his birth! Thus we see that it is the old pagan myths that are still being celebrated on the 25th, even by those professing to be followers of Christ, those who still buy into all the untruths and follow blindly. These days so many aspects of the Winter Festival, wrongly and sadly celebrated under the banner of the birth of Christ, do seem to be one huge festival of consumerism and consumption which so many folks just simply buy into without any question. So in essence if one breaks it all down and puts it simply; the Chistians are celebrating pagan myths on the 25th December whether they realise it or not! And the pagans are celebrating something from a fabricated past that never existed anyway! Of course one can still celebrate the return of the Light on the 21st because that is a fact, the light will return. Yet celebrate in a much simpler, sacred, deeper and more profound way by honouring the earth and the cycles of the land and of our place in the universe; a time for sharing the ultimate, albeit fleeting joy of life, with others and in doing so one is also honouring the Christ and the true reality of His Word. Gi be dag ma dara bi ar. Night to be day and dark to be light. Written by yours truly with exerts from the Templar Degree Scriptures, Priory Scriptures, my own thoughts and My Grand Priors invaluable guidance and teachings. Suspended in the illusion of Time. Future and past tightly woven as one into the tapestry of destiny. Manifesting into dreams and desires that were once only that. Time lines changed by those who weave the web. But tell me, was it woven from the inner realms of my subconscious? Or do the starlight worlds pull silken threads tight around my soul? Tightening still as known worlds fade to grey, disappearing before heart and eyes wide open. And the Howling Wolf casts shadows of silver and blood upon my life. I reach and grasp the thread, allowing the tide of destiny to flow within my heart. The night sky becomes an open book for this eager clay born infant. The words have always been written, yet read by few. Only now can I even begin to read between the lines. Us who hide inside this human form and dare to sip the Cup of Life, innocently unaware that it is we who are the Key? When Time unfolds, our future surely was always written by the Star of Insight and our paths already sacrificially trod by Messengers of the past. Past and future only now become one and the unseen becomes the seen to those of The Way. A Warrior of the Serpent Ways; always questing upon the sphere of time. Sharing and teaching to those who are open to receive. Come my love and meet me upon the lip of midnight. 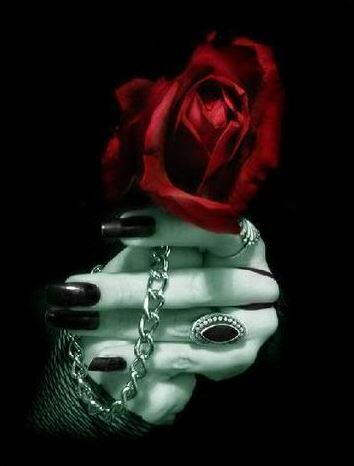 I’ll take you into darkness true. Or steal from you that precious thing of which you value so. Come waltz with me upon the land of precious time. As you whirl and spin upon the night times’ edge. Come to me my love of love. Come embrace my spell so pure. We’ll dance till midnight claims your soul in a land I know so well. A sup of life so true.